If you love outdoor adventure sports like hunting, then you probably have used a sporting rifle. AR 15 rifles are the most popular among users as they are readily available and simple to use such that anyone with brief familiarity with guns can easily handle them. Their popularity has made AR15 more abundant and versatile, and hence a number of scopes and accessories are available for this rifle. Scope mounts are the firearm accessories are vital gears that shooters seek when they want to increase their shooting efficiency, especially on targeting long distance. Since even the best quality firearm may not work exactly as you wanted, accessories like scope mounts are designed to maintain a high precision and consistency while shooting. Offset mounts are especially important for those who shoot/hunt with larger scopes to quickly acquire a target with a larger sight picture. Generally, scope mounts are a must-have firearm accessory for those who use a scope with an overly large objective lens. Scope mounts usually consist of bases and rings so as to keep the rifle scope in a steady and accurate position with respect to your target. With a Scope mount that best fits your firearm, you will surely have a more enjoyable and fruitful hunting experience. Scope mounts from several different manufacturers are available that are compatible for an AR15 rifle. Here, we have researched and reviewed the best Scope mounts for AR15 with detailed features and specs. These mounts were tested and tried by experts in our team, and we hope that this review helps you choose the best mount that meet your needs. Keeping up to the mark of its brand name, Nikon has lead the optics industry for a long time. Nikon produces a high-quality line of mounts for hunters and shooters to meet their needs. Nikon P-series “Riflescope Picatinny Mount for 1 Inch Tube” is one of the best scope mounts available in the market if you are looking for firearm accessories to enhance your shooting experience. Check out the price and reviews here. 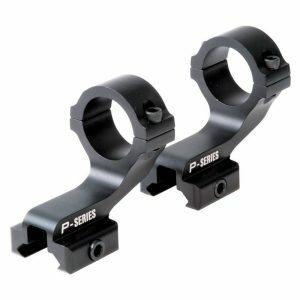 Nikon P-series Scope mount rings are made of black alloy materials and are built to perfectly fit for flat top Picatinny rails and rifle scopes with one inch tubes. Though this mount was specially constructed for AR15 rifles, it can be transferred to just about any other rifle that you own. The scope rings are offset, and hence they can be reversed to fit both the regular and compact scopes without spoiling any eye relief. Performance wise, Nikon P-Series Riflescope Picatinny Mount does a brilliant job of allowing an optimum mounting height and proper fore-aft positioning. This mount is only 5 ounces in weight and very easy to install. One of the best things about this mount is its versatility that makes it suitable for most of the 1 inch tubes. Made of rugged aluminum alloy, Nikon P-series have hardly any drawbacks. It is best suited for hunters and shooters who need the flexibility of a two piece scope mounting system. As a company that is committed to supplying customers with high quality precision products, CCOP has delivered a range of firearm accessories. 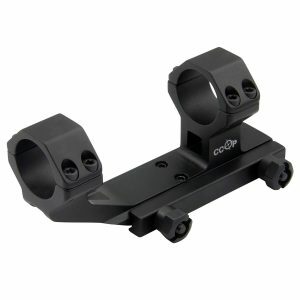 The CCOP High Profile AR-ArmourTac Rifle Scope Mount is the best 30mm scope mount that is a brilliantly designed riflescope mount if you are searching for ways to make your rifle a high-profile. This mount fits to any Piactinny rail, and it is an all-black, single piece device made of performance grade aluminum alloy. This scope mount is designed to fit any 30 mm riflescope, and it can be installed by a series of screws. For an easier installation, the product comes along with Torx screws and Torx driver as well. The device is about half a pound in weight. When we tested this devices, we really loved the structure of ArmoutTac 30mm (1.18′) mount. This mount is excellently durable, and the wide girth of the rings offer a firm grasp on our scope. Strong aluminum alloy build makes this mount even more efficient. It has a forward extension of 2 inches. With a durable rugged construct and high-end performance, CCOP High Profile AR-ArmourTac Rifle Scope Mount is no wonder the best scope mount for AR15 out there in the market. The choice of scope mounts depends largely upon the size and type of your scope, and the best scope mounts for AR15 rifles will have most of the features discussed above. Since the scopes above are made of high quality aluminum alloy for lightweight performance and durability with enhanced features for compatibility and versatility, these are some of the best scope mounts for AR15. With these mounts, we can guarantee that you will have a hunting experience like never before.